Last week, we promised to follow our Dog Days trivia - and info on Sirius the dog star - with information about the place of honor cats hold in the night sky. Are there stars named for cats? Is there a constellation with a decidedly feline bent? Why yes, and we're so glad you asked. Allow us to introduce you to three - count'em three - constellations named for the feline species: Leo, Leo Minor and Lynx. Can you see the majestic arch of the lion's neck, right side of frame? Leo is by far the most well known. You'll see him best in the northern hemisphere during the first full month of spring. That's when he dominates the southern sky. Comprised of 10 "anchor" stars, Leo is one of the earliest constellations identified by mankind, with records that go back as far as Mesopotamia in 4000 B.C.E. 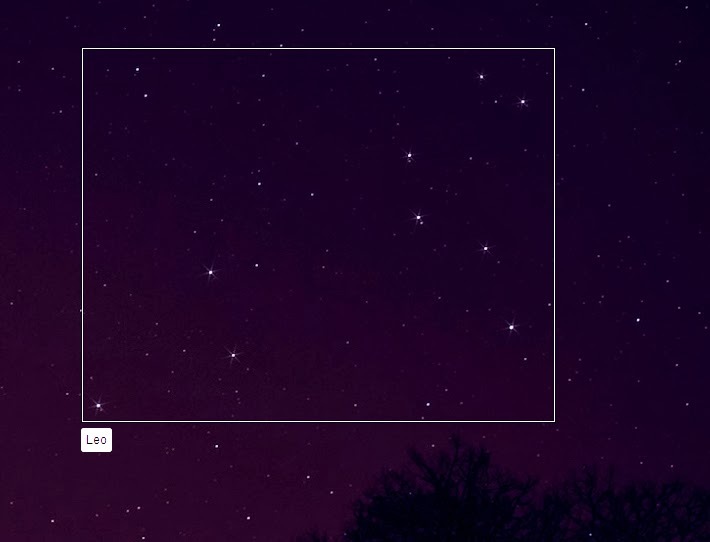 The brightest star in Leo is Regulus - 69 light years away and 110 times as bright as our own sun. But what we found most interesting was that it seems to have always been identified as a lion. According to Wikipedia: "The Persians called Leo Ser or Shir; the Turks, Artan; the Syrians, Aryo; the Jewish, Arye; the Indians, Simha -- all meaning "lion". Babylonian astronomy identified the constellation as the "Great Lion" and called Regulus "the star that stands at the Lion's breast." 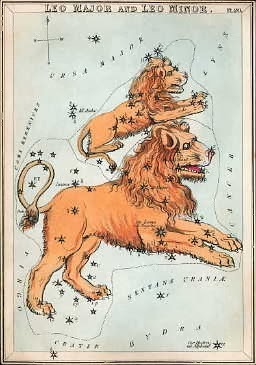 According to space.com, Leo's main identifying feature is a backward-question mark curve of six stars that form the lion's head. 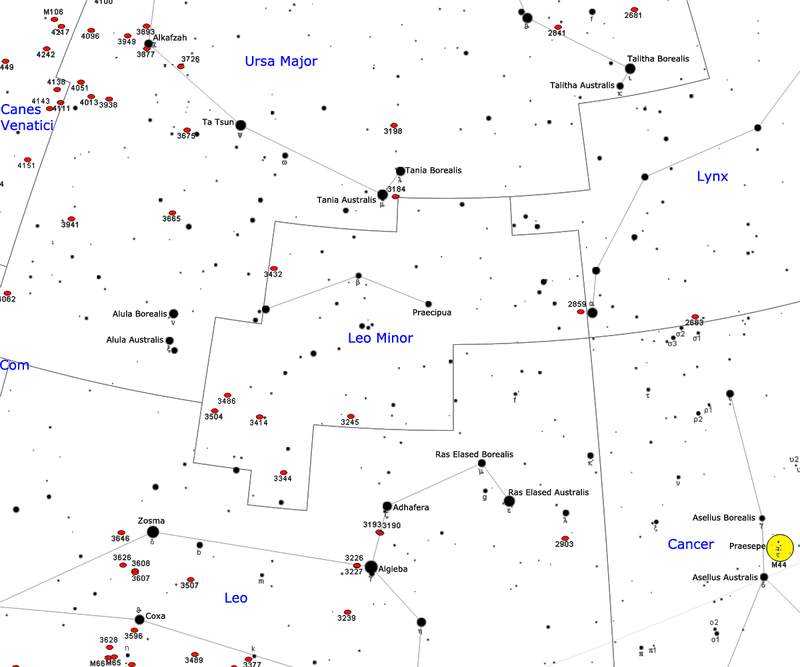 Interestingly, there was temporarily a fourth constellation named for the cat. In 1799, French astronomer and cat lover Jérôme Lalande felt sorry for the domestic cat, as she had no constellation named after her (evidently lions and lynx weren't close enough to satisfy), so he named a group of stars "Felis." Located next to the constellation Hydra, the constellation is now obsolete. Illustration by Jonathan Bode 1801. Public domain. So yes, we'd say the cat is nicely represented in the evening sky. What is a Thursday Trivia without a peek into the origins of an animal-related saying? And so we come to today's phrase. Because you see, during the hottest days of August, dogs may rule the day but cats rule the night! You'll find the term "Cat Nights" in calendars across the Americas and Europe to this day. As the Dog Days of summer draw to an end, they transition into Cat Nights on August 17. And all of them identify an old Irish folk tale as its origin. Faraday liked to test out his lungs even as a kitten! The legend stated that a witch could change to a cat and back again eight time, but on the ninth, she was forever trapped in the cat form - and the yowling of the cat was the witch lamenting her fate. According to the legend, caterwauling is particularly prominent on August 17th. Despite extensive searches, the oldest reference to the term "cat nights" that we could find in print was in the Old Farmer's Almanac, which dates back to 1792. Wow, we DO see Leo. We will look for it at night tonight! We have to admit we are hopeless with the stars. We can never see what everyone else can see. Have a tremendous Thursday. Hmmm... At my house caterwaulin' hits a peak durin' the months of September to April, inclusive. Of course, at my house, all caterwaulin' is done by ol' peepers when she practices for her caterwaulin' society. What are THOSE days called? It took us a couple of looks, but we did see it!!! We never heard the term Cat Nights before! We looked and looked and looked and now we see stars...swirling around our heads! MOL. The witch in Boomer must have gotten her time all messed up. Hahaha! Wow! just Wow! 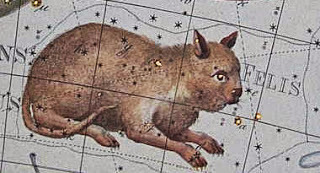 I have never grasped astronomy, but I now love to know that an early astronomer was a cat lover--and no, the one artist may have seen some sort of large rodent, but that was not a cat for sure. Really interesting as always. Goodness we agree that that Felis is rather, um, odd to be kind.